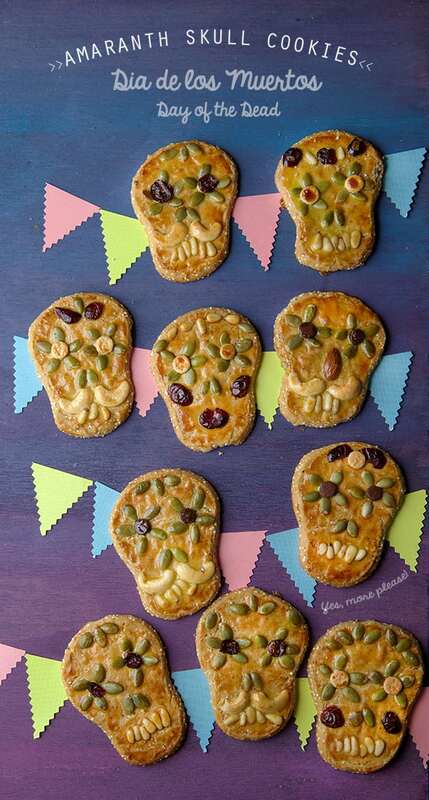 Day of the Dead Amaranth Skull Cookies ~ Yes, more please! The intention behind the natural ingredients was to make a delicious cookie without utilizing too much sugar and to avoid the artificial coloring which in my opinion can affect flavor. I left those bright colors for the decorations on the altar and I like to leave the edible food more natural. 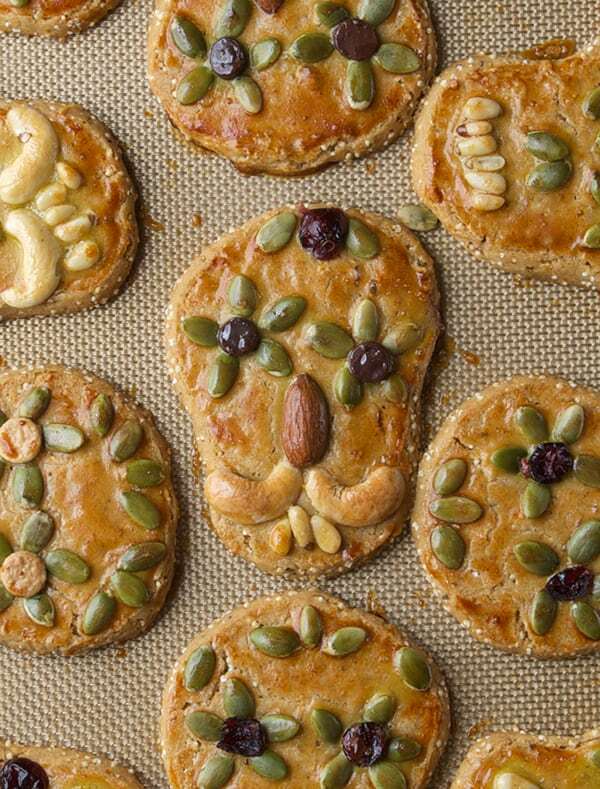 Beside the looks, these seeds and nuts when baked into the cookies gives them a delicious flavor. I used pepitas for the flower decoration on the eyes, chocolate chips and dry cranberries for the eyeballs. For the teeth: Pine nuts and Sunflower seeds, almonds for the nose, and cashews for the gentlemen’s mustaches. 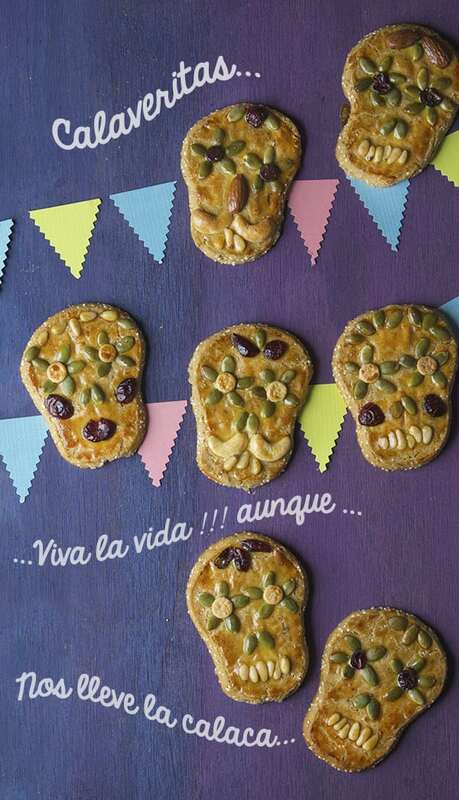 These cookies are just the perfect treat for Day of the Dead. They are sweet but not overly sweet, just the way I like them. 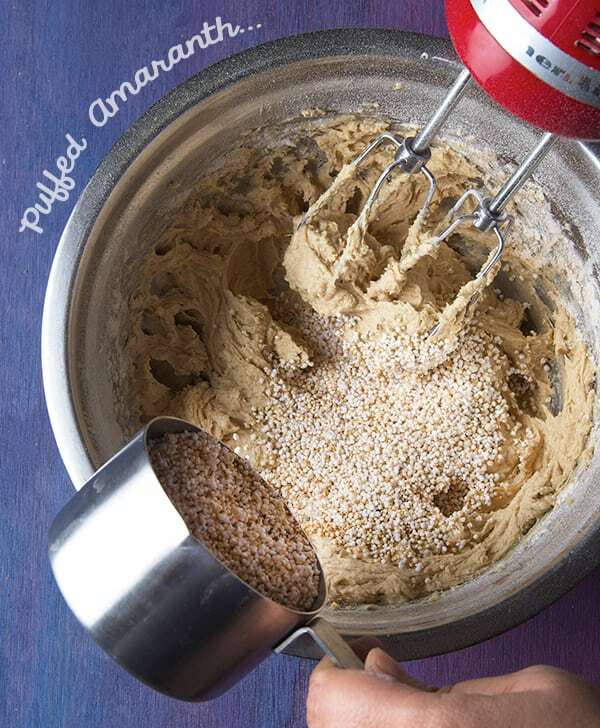 Amaranth gives the cookie a great texture and lots of seeds that give flavor and character to this buttery and nutty cookies. It is really fun to decorate with seeds, utilizing their different shapes and combining colors and textures. Use your imagination and have fun. I think this can be a fun project that can involve your kiddos, whether you believe in tradition or if you are Mexican and have forgotten about this great tradition, this can be a great project to get in touch with your roots and pass along some history and memories with your kids. 1. 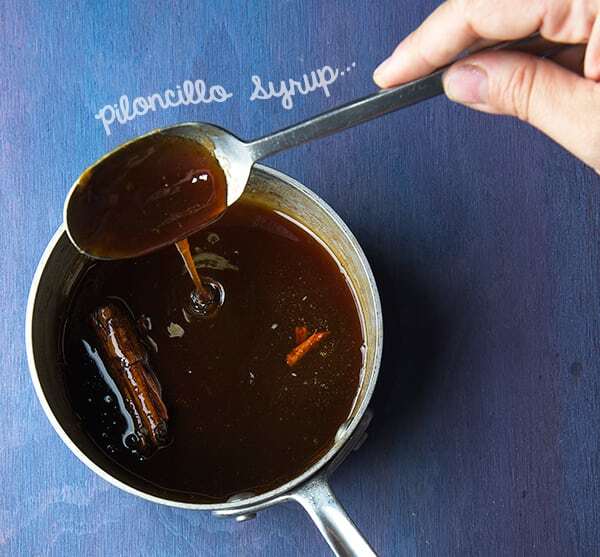 In a small pot place the piloncillo cone, cinnamon stick and 1/2 cup water. Heat up and bring to slow simmer until all the Piloncillo cone has dissolved, and it resembles to the consistency of a thick syrup almost like honey. Let it cool off while you prepare the rest of the steps. See picture below. 2. In a medium size bowl, using a hand mixer, whip the butter until pale. 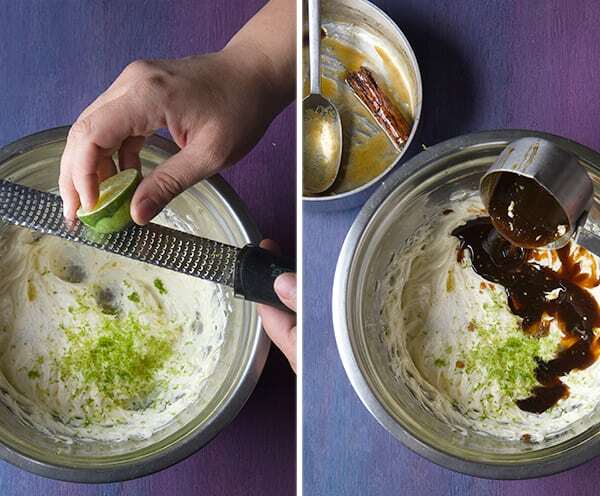 Add the lime zest, lime juice, vanilla extract, and the cooled Piloncillo syrup. Whip for 2 more minutes with the hand mixer. 3. Sift both flours and salt over the butter mixture. 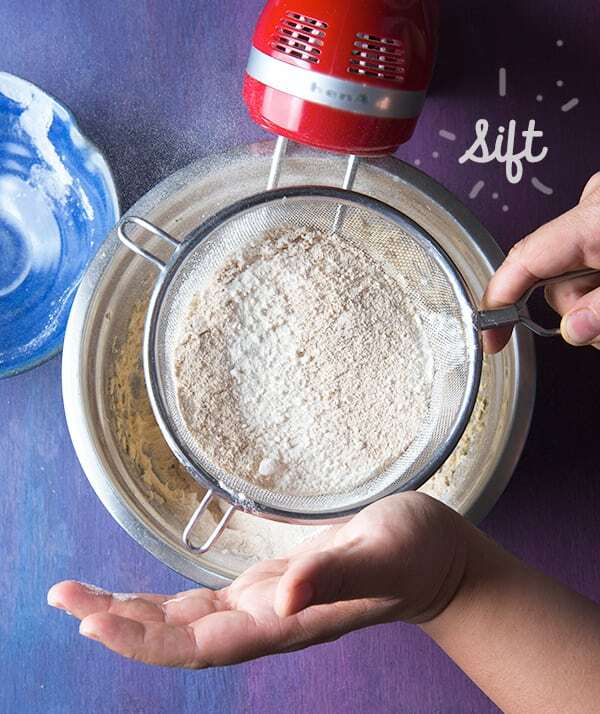 Using the hand blender on low, mix until flour is incorporated, about 15 seconds. Add the puffed amaranth and whip for 5 seconds until its incorporated. Do not over mix. 4. Dump the cookie mixture into a baking sheet lined with parchment paper. With a flat spatula spread the cookie dough into an even rectangle. Place another piece of parchment on top of the spread out cookie dough. 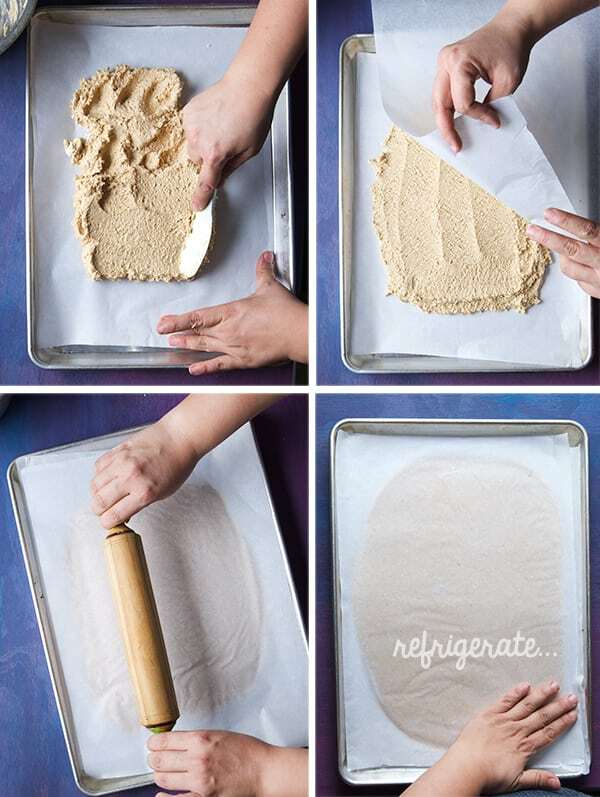 With a rolling-pin evenly flatten the dough until it’s about 3/4″ thick. 5. 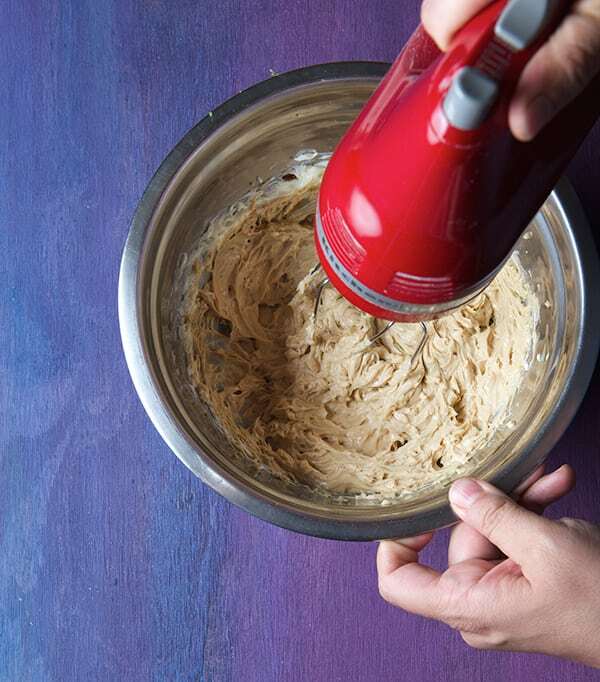 Carefully slide the papered cookie dough into the baking sheet and refrigerate for at least 20 minutes, 30 minutes its best. 6. 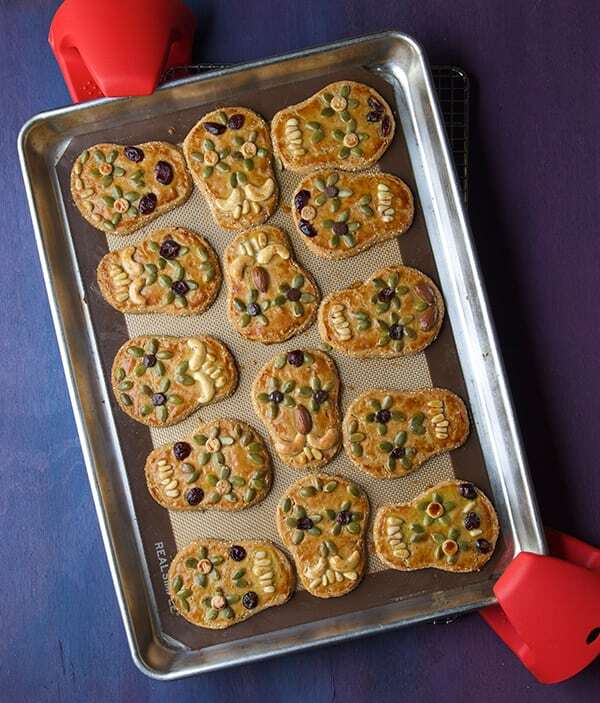 Once the cookie dough is chilled, prepare a baking sheet lined with a silpad, or parchment paper. 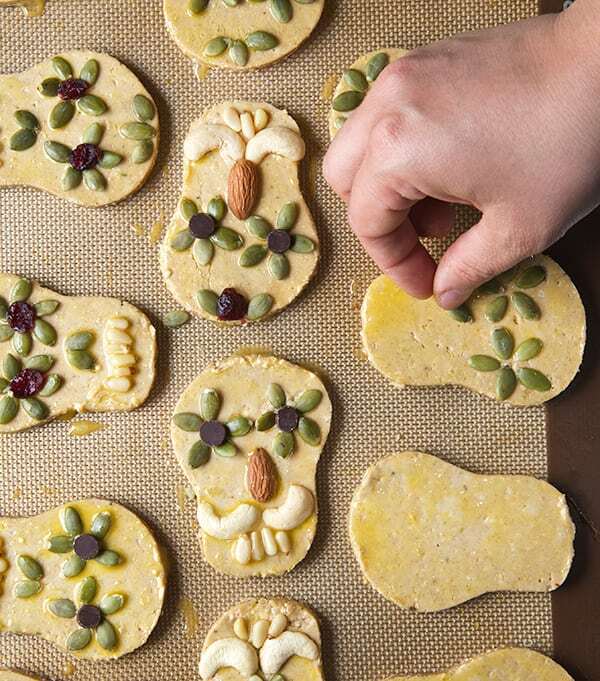 Place the cookie dough into a flat clean surface, peel the top parchment paper and cut out the cookies with a skull shaped cookie cutter. 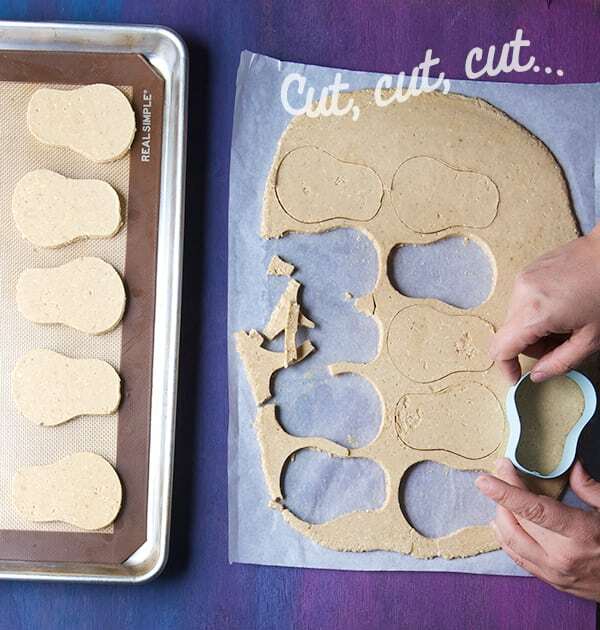 Place the shaped dough into the tray about 1/2 inch separation in between each cookie. By now you should have about 14-15 uncooked cookies. Gather the rest of the dough and gently press it together, place the parchment paper on top, roll it up and refrigerate for next batch. 7. Now the FUN begins! 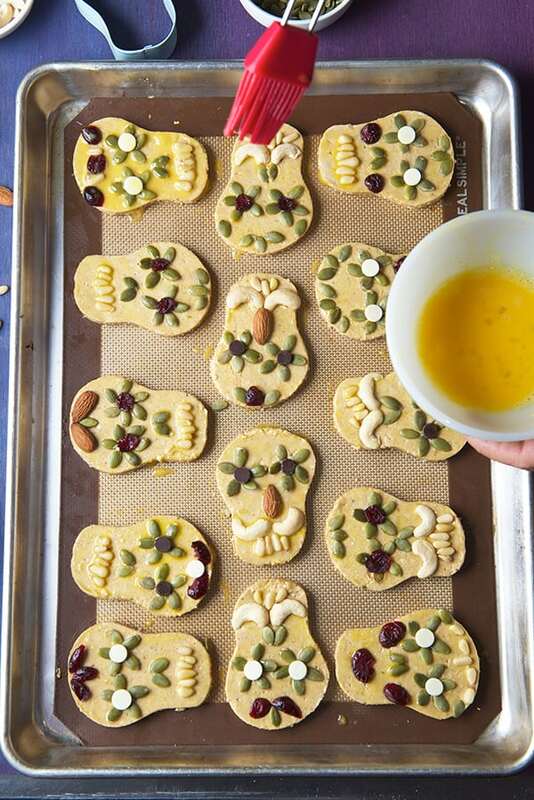 brush each cookie with some egg wash and start decorating the cookies. Make sure when you place each seed to GENTLY press into the cookie. See picture below. 8. 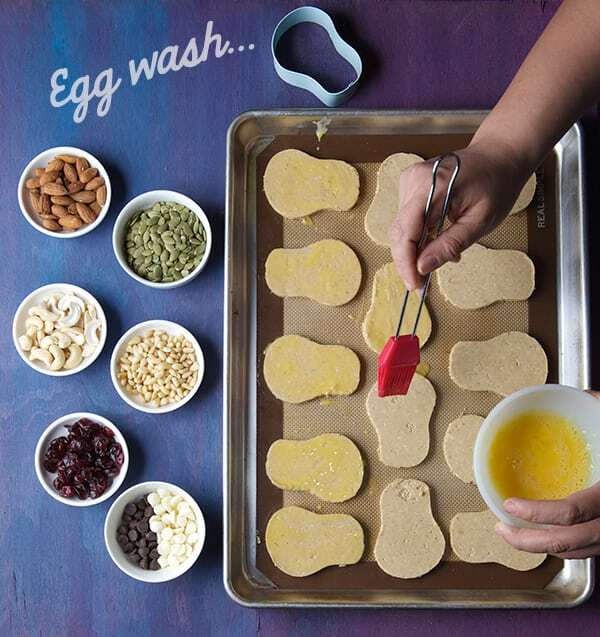 Final, lightly brush the cookies for a second time with egg wash. This will protect the seeds from burning when baking and it will give the cookies a beautiful glossy finish. Place the cookie tray in the coolest part of your refrigerator for about 15 minutes before baking. 11.Remove the tray from the oven and allow the cookies to rest for another 2-3 more minutes until they firm up and are ready to handle. 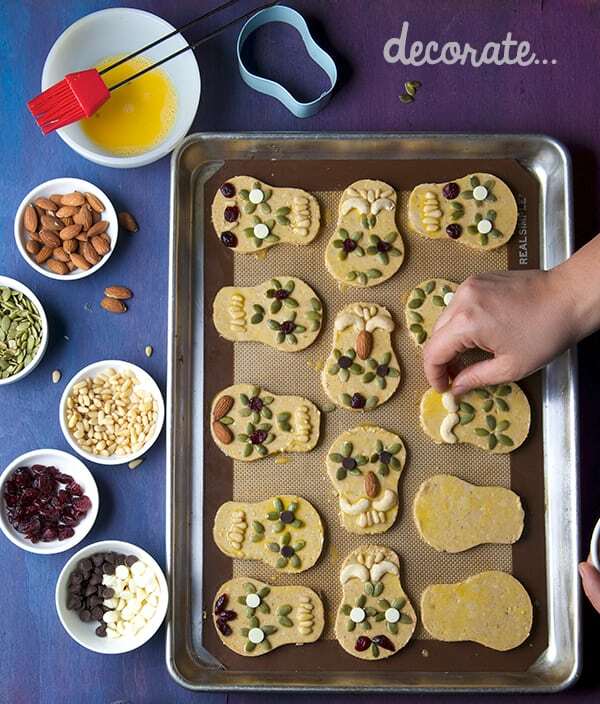 With a cookie spatula, gently transfer them to a cooling rack.Please eat a cookie NOW! Once they are completely cool, keep them on an airtight container. 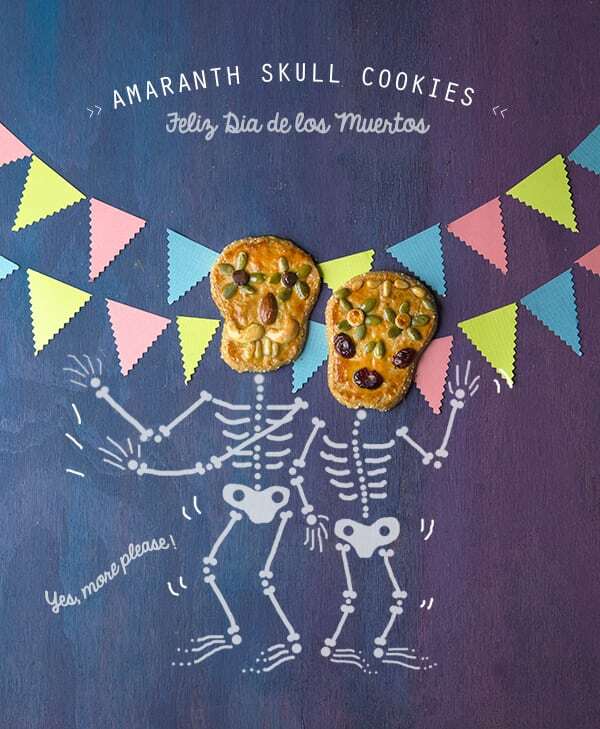 These Amaranth Skull Cookies last for 4-5 days, (if you are lucky) They are great for breakfast with a cup of tea or coffee, or ideal for an afternoon pick me up snack. The Day of the Dead is coming soon, starting October 31st with All Saints Eve, November 1st All Saints Day and ending November 2nd with All Soul’s Day. I have written a previous post with the origins and history about Day of the Dead, and this beautiful Mexican tradition. Dia de los Muertos, It is not only about the cool and colorful looking skulls, It has a deeper meaning with strong roots and traditions since pre columbian times. 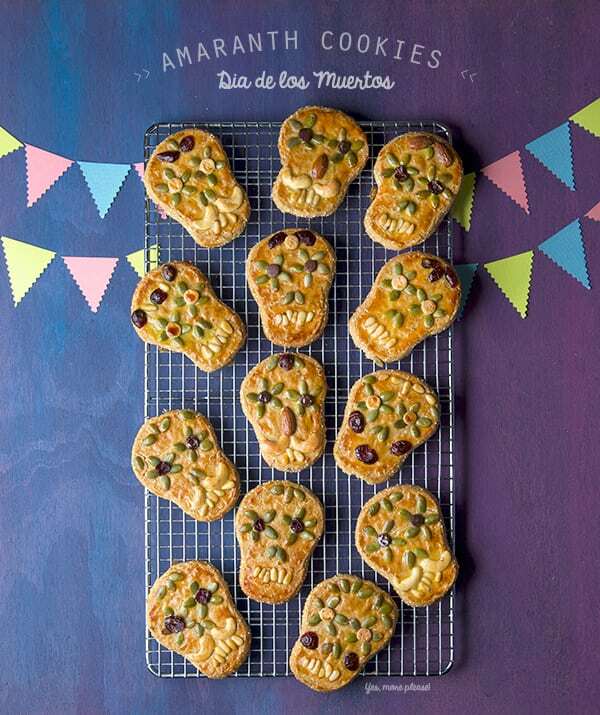 If you want to know more about it, please check this previous post that also includes a great recipe for Pan de Muerto and the easiest recipe for Sugar Skulls! If you want to learn more about it click here. Feliz Dia de los Muertos, Let’s celebrate life after dead!